Omar Suleiman, the new vice-president of Egypt, told the Israelis he wanted to start “cleansing the Sinai” of Palestinian arms smugglers, according to leaked cables. The news is more evidence of the close ties between Israel, the United States and Mr Suleiman, who is tipped to replace Hosni Mubarak as Egypt’s president. The close relationship has emerged from American diplomatic cables leaked to the WikiLeaks website and passed to The Daily Telegraph. Mr Suleiman is Israel’s preferred candidate to replace 82-year-old Mr Mubarak. A secret hotline between Mr Suleiman and the Israelis was said to be “in daily use”, according to US diplomatic cables. The pledge to cleanse Sinai was made by Mr Suleiman to Yuval Diskin of the Israeli Security Agency (ISA) after he complained about the smuggling of weapons across the border with Gaza. According to a cable sent in November, 2007, Mr Diskin met Rob Danin, the US deputy assistant secretary of state, and Mark Kimmitt, the deputy assistant defence secretary, in Tel Aviv and told them that the Sinai peninsula had now become a “weapons and explosives warehouse” for operations in Gaza, Egypt and Israel. The cable said: “Diskin told Danin and Kimmit [sic] that the ISA had, on several occasions provided Omar Suleiman, chief of Egypt’s intelligence services, with detailed intelligence on the names of smugglers. Mr Suleiman worked hard to position himself as the main Egyptian link with Israel. According to the cable, he was blocking attempts by the Israelis to form links with other members of the Cairo government. This was, according to Mr Diskin, because of Mr Suleiman’s “desire to remain the sole point of contact for foreign intelligence”. CAIRO — The Egyptian military consolidated its control Sunday over what it has called a democratic transition from three decades of President Hosni Mubarak’s authoritarian rule, dissolving the country’s feeble parliament, suspending the constitution and calling for elections in six months in sweeping steps that echoed protesters’ demands. The statement by the Supreme Council of the Armed Forces, read on television, effectively put Egypt under direct military authority, thrusting the country into territory uncharted since republican Egypt was founded in 1952. Though enjoying popular support, the military must now cope with the formidable task of negotiating a post-revolutionary landscape still basking in the glow of Mr. Mubarak’s fall but beset by demands to ameliorate hardships that percolated across Cairo on Sunday. Since seizing power from Mr. Mubarak on Friday, the military has sought to strike the right note, responding in words and action to the platform articulated by hundreds of thousands in Tahrir Square. But beyond more protests, there is almost no check on the sweep of military rule, and while opposition leaders welcomed the moves some have quietly raised worries about the role of the army in Egypt’s future. But others were more optimistic. Ayman Nour, who lost to Mr. Mubarak in the 2005 election, said that the military’s actions should be enough to satisfy the protesters, some of whom nevertheless refused to leave Tahrir Square and resisted soldiers’ attempts to evict them. WASHINGTON (AP) — President Barack Obama on Friday welcomed the peaceful transition of power in Egypt with the resignation of longtime President Hosni Mubarak. “The people of Egypt have spoken. Their voices have been heard. And Egypt will never be the same,” he declared. In brief remarks in the Grand Foyer of the White House, the president noted that it was “not the end of Egypt’s transition, it’s a beginning.” He said that many important questions remain to be resolved and difficult times lie ahead. “I’m confident the people of Egypt can find the answers,” Obama said. 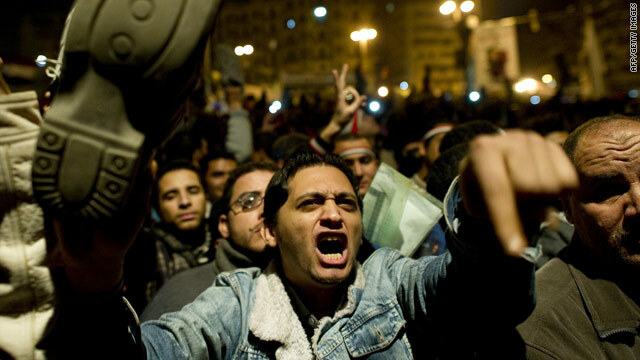 He spoke hours after Mubarak stepped aside, turning authority over to the military. It was a turnaround from the night before, when the Egyptian leader defiantly refused to give up his title. CAIRO — President Hosni Mubarak of Egypt turned over all power to the military, and left the Egyptian capital for his resort home in Sharm el-Sheik, Vice President Omar Suleiman announced on state television on Friday. We will probably see a follow up soon…by Paul Wolfowitz. The latest developments, as confirmed by CNN, on the uprising in Egypt. Throngs of demonstrators have taken to the streets of Egypt’s major cities to demand an end to President Hosni Mubarak’s 30-year rule, prompting the government to deploy the military to deal with civil unrest for the first time in a generation. Check out our full coverage and the latest tweets from CNN correspondents on the ground. [Update 1:08 a.m. in Cairo, 6:08 p.m. ET] Tweet from opposition leader Mohamed ElBaradei: Egypt will explode. Army must save the country now. In an interview with CNN’s Wolf Blitzer, ElBaradei said it’s unclear whose side the Army is on. As for Suleiman taking control of the presidency? [Update 1:00 a.m. in Cairo, 6:00 p.m. ET] Parliamentary speaker Ahmed Fathi Srour tells Nile TV that President Hosni Mubarak’s move puts the authority for the day-to-day running of the government in Vice President Omar Suleiman’s hands. That would include oversight of the police, the Interior Ministry and other key agencies, control of economic policy and running any negotiations with the opposition. Srour echoed Mubarak’s statement in adding that the constitution specifically prohibits the president from delegating other key powers to the vice president. As a result, power to dismiss parliament or dismiss the government and the power to ask for amendments to the constitution remain in Mubarak’s hands, not Suleiman’s. 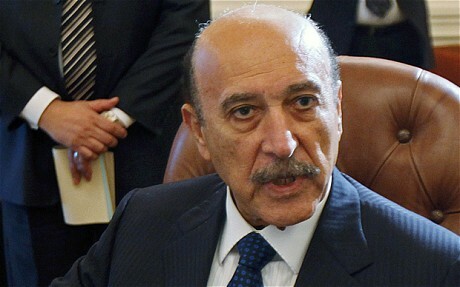 Mubarak Stepping Down- VP To Take Over? CAIRO (AP) – Egypt’s military announced on national television that it has stepped in to “safeguard the country” on Thursday and assured protesters that President Hosni Mubarak will meet their demands in the strongest indication yet that Egypt’s longtime leader has lost power. In Washington, the CIA chief said there was a “strong likelihood” Mubarak will step down Thursday. 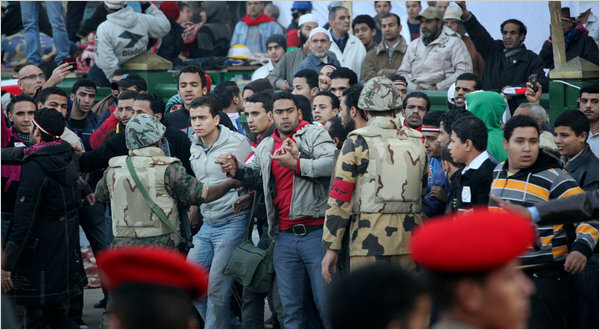 The dramatic announcement showed that the military was taking control after 17 days of protests demanding Mubarak’s immediate ouster spiraled out of control. Gen. Hassan al-Roueini, military commander for the Cairo area, told thousands of protesters in central Tahrir Square, “All your demands will be met today.” Some in the crowd held up their hands in V-for-victory signs, shouting “the people want the end of the regime” and “Allahu akbar,” or “God is great,” a victory cry used by secular and religious people alike. The statement was labeled “communique number 1,” a phrasing that suggests a military coup.